We're in the mood for a little something, so we're declaring Small Bites Week: We're serving up a week's worth of tasty, relatively heathful appetizers, no utensils required. First up, a sweet and savory dip we couldn't stay away from. And that's OK, because it's pretty darn good for you: no added fat or sugar. 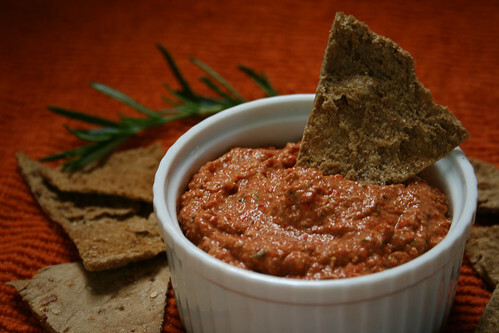 Its rich, vibrant color is a nice alternative to the family of onion, ranch, sour cream dips. This went over well with kids and adults -- my 5-year-old would eat this with a spoon. Me too. This sweet, healthful dip pairs beautifully with celery and jicama, but I like it best with homemade whole-wheat pita chips (recipe follows). You can use roasted red peppers from a jar, but it's easy enough to make your own. Makes about 2 cups of dip. Combine all ingredients in the work bowl of a food processor and puree. Refrigerate four hours to overnight. Wash and dry sweet bell peppers. Slice in half and remove seeds and membranes. Lightly spray a baking sheet with olive oil and lay peppers cut-side down. Broil for 10 to 20 minutes until pepper skins are charred and blistered. 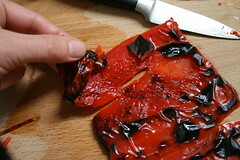 Transfer hot peppers to a bowl and cover tightly with plastic wrap. Wait at least 15 minutes, then remove peppers and slip off blistered skins. Use peppers immediately, store in refrigerator (I don't know how long they keep -- ours disappear within days), or freeze. Preheat oven to 400 degrees. Cut whole-wheat pitas into 8 wedges, then split each wedge in half to form 16 triangles. Spritz with olive oil spray or brush lightly with olive oil; squeeze a few drops of lemon juice over them and sprinkle with sea salt. Lay pita wedges on a baking sheet and bake for 5 to 7 minutes, until crisp and lightly browned. Store in an airtight container.